After a very electronic overture, spiced of sound hoops, of galactic effects and of industrial pulsations, a line of sequences makes swirl its juicy keys whose resonances enriches a first structure of ambient rhythm. Sober percussions get grafted to these keys which climb to infinity, one can have the impression that they also come down, creating a 2nd line of a more linear rhythm where coil up the harmonious loops of synth solos. Playing skillfully inside its envelope of 8 minutes, Sayer leads "Stellar Remnants" towards limbo where everything becomes in suspension for a few seconds. The time where some superb sequences start to crackle sharply on the roundness of the first ones which now wave as silkworms. That hangs our sense of hearing and, above all, our attention! The synth solos maintain them ancestries on the rhythm now subdivided between its membrane of stillness and the new one which is more lively. That so explains us why the borders of EM are so unlimited. I had fallen under the multiple charms of Sounds of Atoms in 2014. That was one of the good albums of electronic rock of this year. It's thus with excitement that I measured my ears with this very last opus of the Californian synthesist who likes playing inside the time frame of his compositions by giving them unexpected forms. That maintains our ears on the alert. Besides Sayer doesn't make in for subtleties with an EM stuffed of bouncing sequences, of metallic percussions, stifling pulsations and of intergalactic synth effects as well as layers, riffs and solos which are delicately embalmed of Tangerine Dream's perfumes. 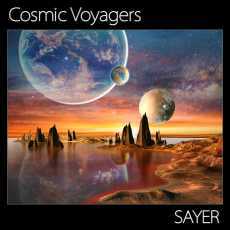 And like in Sounds of Atoms, “Cosmic Voyagers” is built around 10 tracks which border an average time below 8 minutes. And like Sounds of Atoms, it's a solid album of electronic rock a la sauce Tangerine Dream from the Flashpoint and/or Le Parc years with nice catchy melodies and rhythms that loosen their shadows in order to dazzle our ears. An electronic universe rich in unexpected development which can only quench these insatiable ears in search of an electronic rock which refuses banality! The introductions molded in cosmic effects pullulate in the universe of Sayer who is resolutely attracted by these territories filled with speculations. It's in this way that opens "Orion Nebula" which will succeed to switch in a good structure of down-tempo adorned of an approach of Arabian melody. Sayer loves peppered his structures, no matter the kind of rhythms, with unpredictable movements of sequences, so giving this quite particular dimensions to his tracks. It's also true for this slow rhythm of the quicksands country, which increases quite smoothly its swiftness before maintaining a completely interesting electronic pace, that on "Crossing Parallel Universes" for its lively structure of rhythm where sequences are intensely flickering while others moderate the rhythm with an ambient structure which strangely reminds me the procession of a condemned person who goes up staircases, who gets down them again , goes back up and so on. That fills the ears and the wave motions are full of ambient charms. I hear Richard Pinhas, the East/West album, here. The first part of "Nomad Planet" offers us a rather ambient approach with a delicate voice which murmurs Eflic chants on movements of sequences which flicker in cosmos. These booming black sequences sharply oscillate, like loops which interlace a little before the point of 4 minutes. This movement is trenchant and brings us towards a cerebral structure of rhythm where our fingers strum on the edges of our divan and where the synth weaves some multiple astral harmonies. "Intergalactic Navigation" also offers a soft rhythm filled of sweet Arabian essences and which is decorated by some momentums of more lively sequences while being perfumed by effects of industrial gas and by very Tangerine Dream synth layers. "Stellar Nurseries" proposes a rhythm always rather soft with muffled pulsations which hammer without torturing our feet. There are lots of keys which skip like hundreds of lost steps, while the synths, always very rich in this album, savor the whole thing with harmonies which roll constantly in loops and with solos that make us regret these years of creativity. These vintage years! "Andromeda Galaxy" bites straight out our ears with its big heavy and resonant stroboscopic snake which winds the paths of the cosmos. Bangings of hands industrialized by Jean Michel Jarre and another line of sequences, with more crystal clear and nervous keys, add a spasmodic depth while the synth moves on with harmonies which roll in loops on a background of cosmic fog. We hook right away. It's heavy and lively! And it gets transformed around the 3rd minute, solidifying this perception of duality that Sayer imposes on his structures. How can one offer 10 structures that are not similar? Creativity my friends! While we can expect an interbreeding between its 10 tracks, “Cosmic Voyagers” keeps amazing us with "Interstellar Turbulence" and its heavy rhythm fed by pulsating sequences which skip or contort in the hammerings of the percussions. If the melody has this Arabic smack, the rhythm loosens its knots in order to offer constants changes, and superb movements, throughout "Interstellar Turbulence". This is a big track with very creative sequences and percussions! Like the impetuous "Caught in a Comet's Tail" which is a strong electronic rock sculptured in a very good meshing of spasmodic sequences and coated by cosmic effects. Jarre! Where are you? "Endless Journey" pursues the work of charm with a slow and pulsating main rhythm on which is added a line of sequences which makes skip its keys like in an intergalactic hip-hop and another one which makes dance its keys like a skeleton who disperses its bones. The synth lays a melodic balm, as Arabian as dreamlike, while the track goes tenderly towards a beautiful cosmic ballad with a rivulet of sequences which makes sing its keys with layers of angelic voices. It's a very nice ballad which calms down our ears and restores some energy to attack again this other excellent album of electronic rock builds with an approach which banished the lack of originality.